2:13 PM: snowmass: just packed up to drive back to crestone, wating for mikela to return from organizing & preparing volunteers, and doing some door knocking herself. scrolling through my thumb drive images, i stopped when i came to this one, from my gaze series, shot 7/4/2016. time in the linear sense has long since been rendered meaningless in my life. so when was that? july 4th, 2016? doesn’t compute at all. if you take a look at my story page, you may conclude, as did a recent FB friend, that i am a very lucky man. i concur. vermeer the love letter 1669-70 44x38cm. how, i seriously ask myself, did i make this series? why? it was tsarouchis who first introduced me to the magic of vermeer. oh, i had looked over and over at his paintings in the museums. marvelled at his brushwork. but it was tsarouchis who gave me the keys. 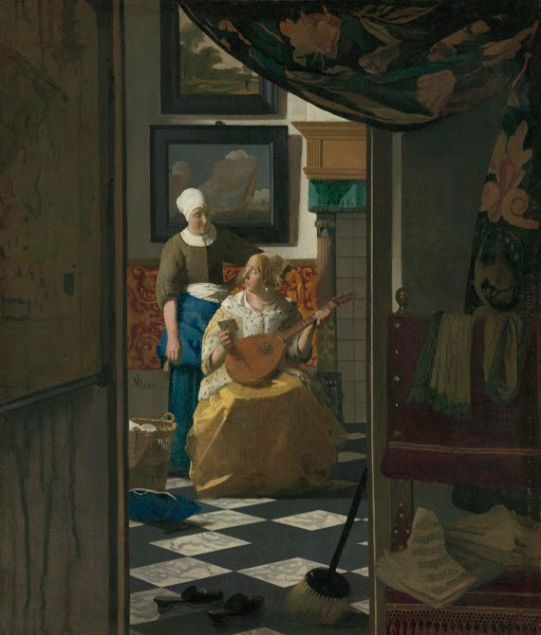 his painting inspired by vermeer’s the love letter, provided the doorway i needed. make it yours, was his message. who, exactly are we talking about? ah, there’s the rub. make it whose?? tsarouchis the letter 1974 130x110 cm. while he substituted friends & lovers in his version, he gave us the gift of better understanding vermeer’s magic and why he stands apart in the history of western art.